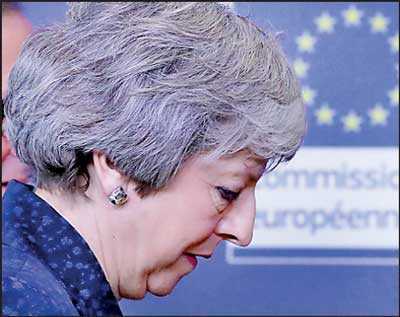 Brussels/London (Reuters): The European Union on Thursday promised to work with Theresa May on “whether a way through can be found” to avoid the disruption of a no-deal Brexit after the British Prime Minister demanded changes to the divorce deal to get it through Parliament. Parliament, which rejected May’s agreement by the biggest majority in modern British history, voted to renegotiate the deal, replacing a provision that some fear could keep British-ruled Northern Ireland under EU rules indefinitely. EU leaders have repeatedly said it would be impossible to replace the provision, known as the “backstop”, because it is required to ensure no hard border, once a focus for sectarian violence, between Northern Ireland and EU-member Ireland. Unless parliament approves a deal, Britain is on course to leave the EU on 29 March with no transition arrangement in place, a scenario that many businesses say would be catastrophic for the economy. Other options could include delaying Brexit, holding a new referendum or cancelling it altogether. “I would have described no deal, no transition a few years ago as a low probability event. I’d describe it now as not the central scenario, so in other words ... yes, the probability has gone up,” he said. May will return to Parliament on 14 February for a debate on the Brexit negotiations when lawmakers could again try to wrest control of the process from her, but a vote on approving the Brexit deal is likely to come later in the month.